What a delight it was to meet with a fine group of creative spirits in an up close and personal way! I was particularly impressed with the atmosphere that was created by the great mix of artists ranging from the “New to SDA”, to those who have been members for over 20 years. I could clearly see a potential for teaching and learning from a pool of rich, diverse and valuable experiences that each member brings to the table. I am excited at the prospect of the learning and sharing of how our life’s journey plays a paramount role in the nature of the creative path we take. I look forward to creating a platform for us to interact in a way that will help us grow together and benefit from our diverse artistic journey. 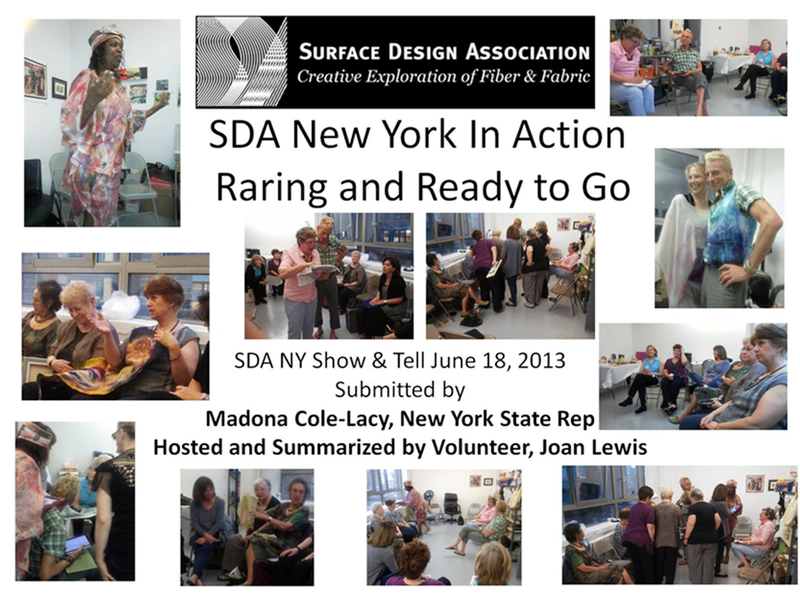 I vow to work closely with the Surface Design Association administrative staff to facilitate this, and to bring other membership benefits to the New York group. Thank you to my SDA New York family members who braved the inclement weather to join us. For those who could not make it this time, please know that we cannot wait to meet you. 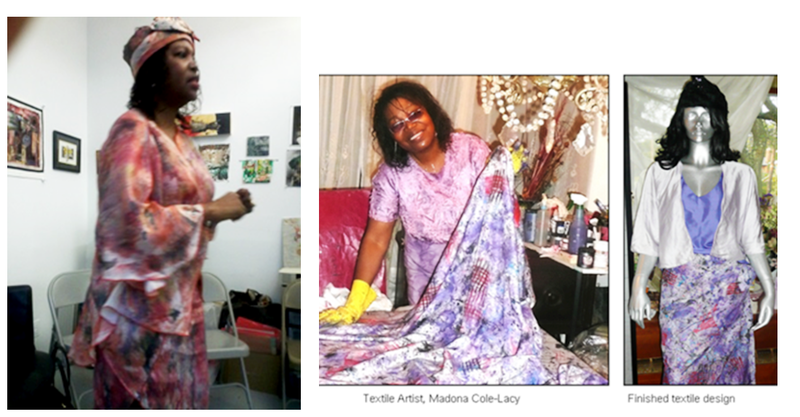 As I thank Joan Lewis our New York Volunteer, for opening her studio to us, I must also acknowledge her labor of love in beautifully summarizing each member’s presentation as well as the essence of the evening. Please stop by soon for more on this. Finally, I shamelessly offer a giant hug to my other half, James Lacy, for his support and for offering to capture with his camera, the spirited moments we enjoyed as a group that evening.